Hortus Camdenensis | Lycoris radiata (L’Hér.) Herb. Bulbous perennial bearing umbels of several wavy-margined, rose-red or deep red flowers appear in summer and autumn followed by the strap-shaped leaves. To 50cm. [RHSE, Hortus, Baker Am.]. 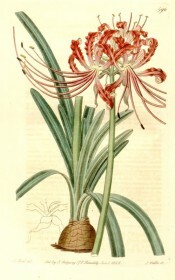 First botanically described as Amaryllis radiata by Charles Louis L'Héritier in 1789 [Sert. Angl. p.15/1789] and placed in Lycoris by Herbert in 1821 [Herbert’s Appendix p.20/1821]. ‘Although known in our hothouses ever since 1750, it has been rarely seen in flower; and the present is the first we have ourselves witnessed. When the late edition of the Hortus Kewensis was published its country had not been ascertained; but it is now however known, from Dr. Roxburgh's manuscripts, to belong to China; and by a native sample in the Lambertian Herbarium to Japan. It comes very near to Amaryllis undulata of the Cape of Good Hope. At Messrs. Colvill's nursery in the King's Road, Chelsea, where the drawing was taken, the plant had been made to flower by being kept during the first part of the summer in the hothouse and then plunged into a common hot-bed. The bulbs are apt to break down into numerous offsets, while the outer coat remains entire, so that they appear like one bulb with numerous leaves; a closer inspection however shows that they consist of several bulbs with 3 leaves to each bulb.’ [BR f.596/1822 as Amaryllis radiata]. Reportedly introduced from China by Fothergill. [ABR pl.95/1800]. Listed in the 1845, 1850 and 1857 catalogues [B.320/1845]. Both Lycoris aurea and L. radiata are well established in the house garden, mostly in discrete areas, almost certainly remnants of plants grown extensively for the cut flower market in the late 19th and early 20th centuries and later transferred to the house garden. Well-defined remnant beds of L. radiata can still be seen in the lower garden.